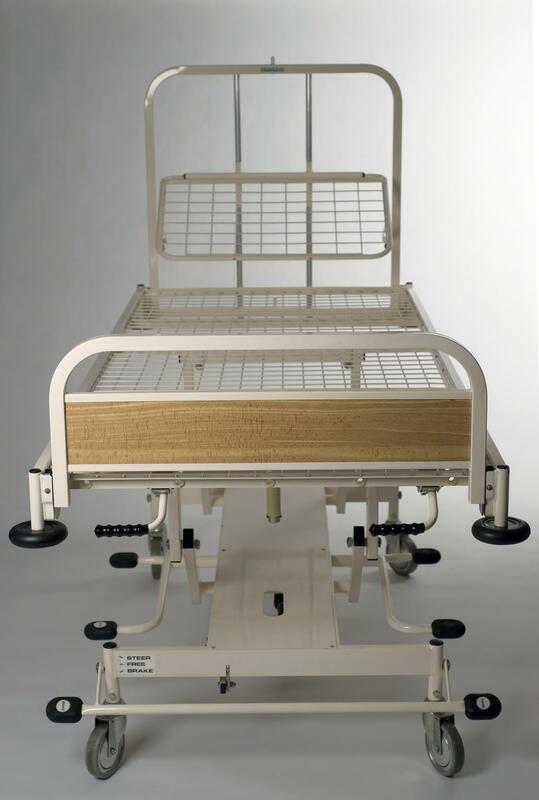 Variable height and tilt hospital bed by Hoskins Healthcare 1994. 5" linked brake castors, pump pedals, hydraulic lift and two way tilt. Head end with variable geometry backrest. Panelled foot end. 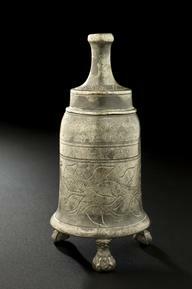 Model number 3100M, often referred to as the King's Fund bed. Walk into a general ward in any British hospital and you will be confronted by beds. Perhaps the most familiar piece of hospital furniture, hospitals are full of beds, but are they just like your bed at home? And if not, how – and indeed why – might they be different? This bed is known as the ‘King’s Fund Bed’. 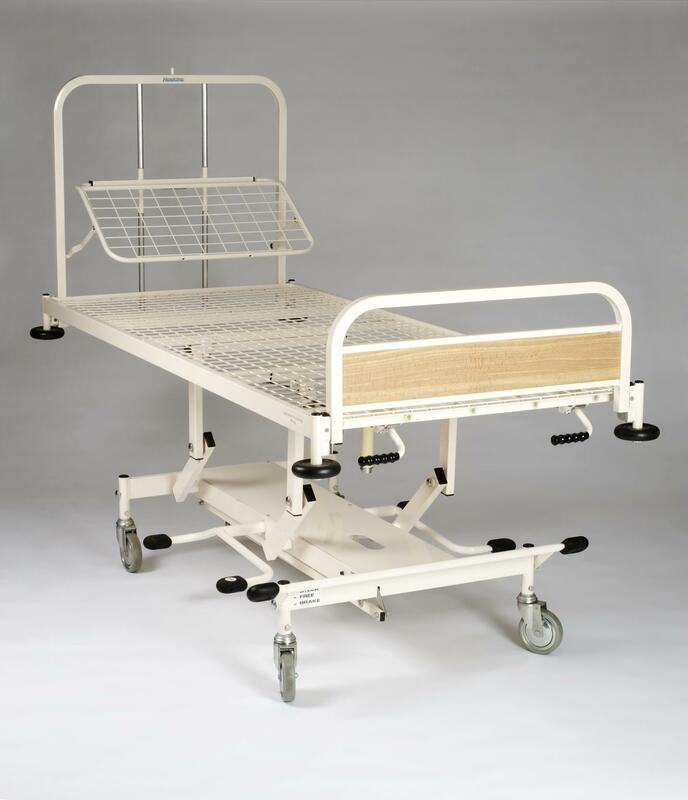 First developed in the 1960s, it revolutionised the role played by hospital beds and set new standards for this aspect of hospital care. 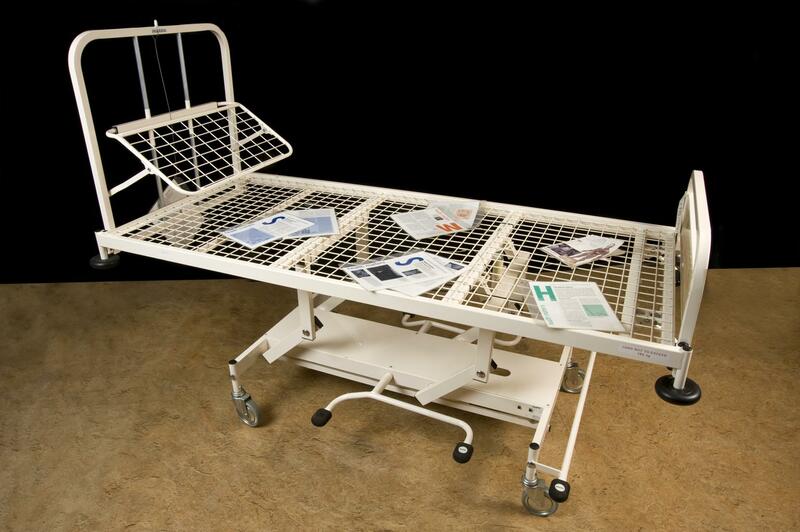 Previously, hundreds of different beds designs existed in British hospitals. 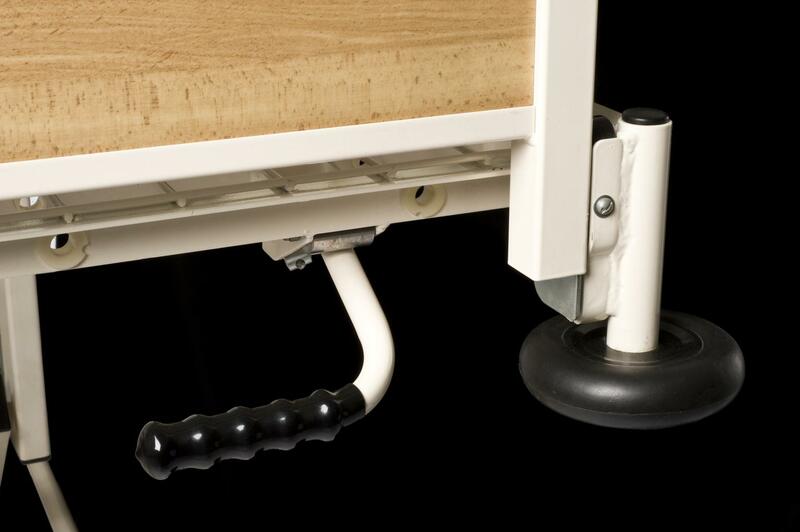 The majority of them little more than heavy, static ‘places of rest’ – like your bed – with little scope for the movements and adjustments that could assist the nursing staff with their work. In a bid to standardise hospital beds and make them far more user friendly, a five year project established radical new specifications. The King’s Fund charity – established in the late 1800s to improve healthcare in the UK – collaborated with a design team led by Bruce Archer from the Royal College of Art. Archer took a controversial scientific approach, with extensive data collection, mathematical modelling and countless hours of observation of the ergonomics of hospital bed-related activity. The result was a bed that was easily moved, height adjustable, had a reclining back-rest and could be easily tilted – changes activated by a series of foot pedals at floor level. 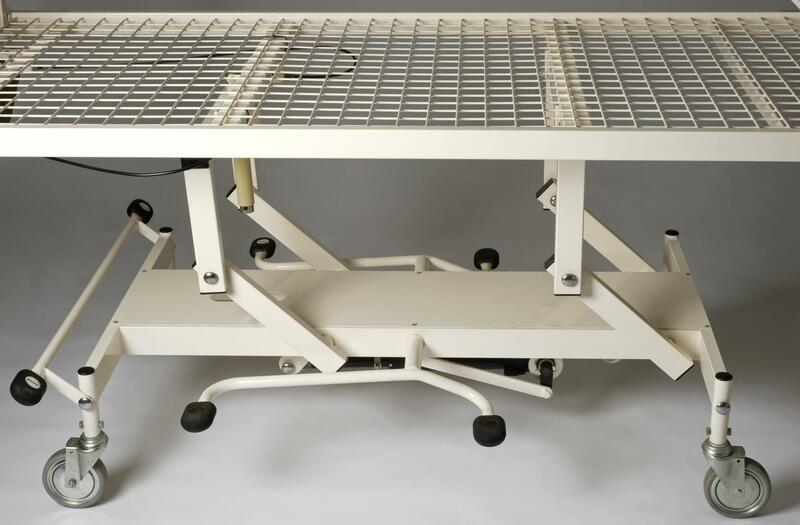 King’s Fund Beds were mass manufactured and taken up by hospitals around the country. King’s Fund Beds are still to be found in the majority of hospitals, but over time there have been changes. 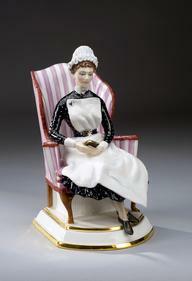 Critics argued that the initial drive of the project was too weighted towards increasing the efficiency of nurses – of which there was a shortage in the early 1960s – rather than patient comfort. 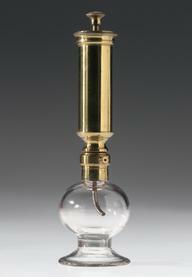 Such concerns were addressed and designs were tweaked and updated. 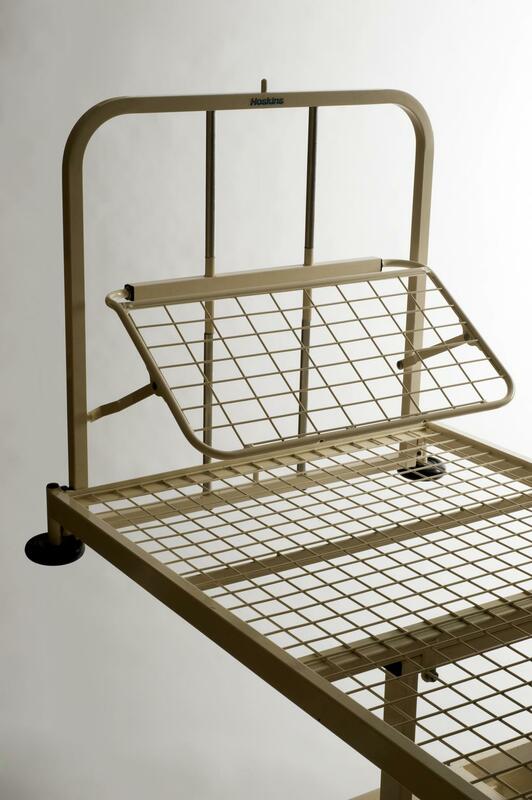 Forty years on, the King’s Fund Bed is the traditional bed we associate with hospital life. But, having blazed the trail, they are gradually making way for a newer generation of even more adjustable, ‘push button’, electrically powered beds.